Three former office/storage spaces located on the south eastern portion of the project will be converted into a 2,450 SF commercial office space. This unique space features high ceilings and decorative architectural features. Base building work includes a new entrance off of Main Street, dedicated bathrooms, and historic restoration of the interior. 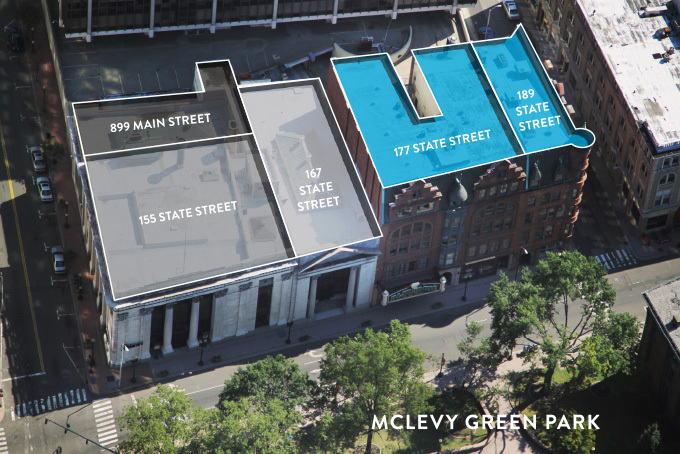 The first floors of 177 and 189 State Street have been renovated into three separate commercial spaces and common areas for the residential apartments above. The 2nd through 5th floors of 177 and 189 State Street have been converted into thirty-two new one and two bedroom apartments with modern finishes and historic, loft-style character.